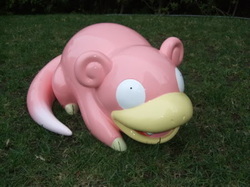 The Ellusive - Slowpoke Well - A Pokémon Collection Site! On this page, I keep a list of what I'm actively looking for! If you see anything here that you own or know where to get, please let me know! So mysterious. 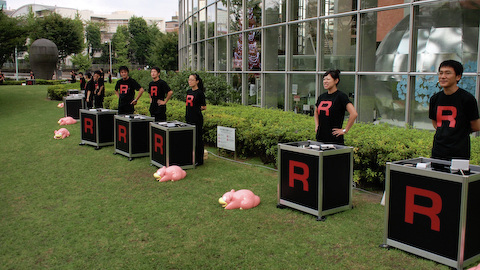 Apparently there were many statues used during some kind of Pokemon promotion (HG and SS) event, as part of a Team Rocket thing. I am severely lacking in information here, and must do more research. What did they do with the statues? Where are they now? I've been looking for this ever since I heard about it months ago, and I managed to find one online. Unfortunately, I overslept the bid and lost it :( I guess I'll have to keep looking, now. 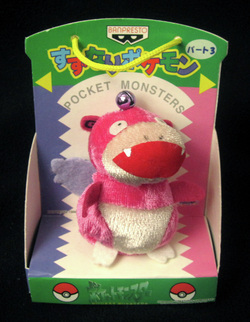 featuring the Slowpoke episode! I think this says episode 8, but I can't read it so well. Man, I should have totally taken the offer when it was handed to me. Hindsight! Auuugh these stamps. Every new release is about the new Pokémon, so the older ones just keep getting harder and harder to find. 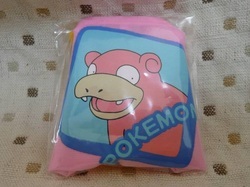 I have Slowbro, but I need Slowpoke! He grabs, and looks adorable doing it. I GROSSLY overestimated his size! After more research on the internet, I found out he can grab on to PENCILS. I've been confusing him for a bigger version! Here is a list of ones that exist! First release of the Metal Figures! I have none of these. I must have all of them! 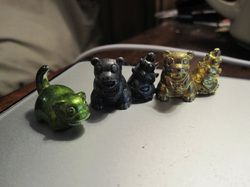 A Slowpoke in all colored metals, I say! note to self: colorful plastic versions are called mini models.